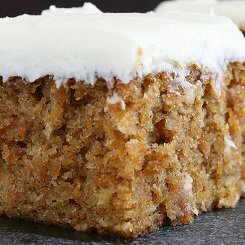 Cream cheese icing is what you would normally find on a carrot cake and using this recipe exactly as it is makes enough to cover the top and sides of a 25cm round cake. The icing is not very sweet but creamy and really delicious. It’s a very versatile recipe so if you like your icing sweeter, add a 1/4 cup of icing sugar to the mix and to make a chocolate version, add the extra sugar and 1/3 cup cocoa powder. This really is the best cream cheese icing you will ever taste so next time you make cup cakes or any cake for that matter, smother them in this fantastic cream cheese icing. Butter and cream cheese must be at room temperature before you start or you will really battle. Add the butter and cream cheese to a bowl and blend together with a mixer or a wodden spoon until well combined, then add the vanilla and give it a very good mix. Now sift in the icing sugar mixing constantly until the mixture is velvety smooth. If you are adding the cocoa for the chocolate cream cheese icing, sift the cocoa and icing sugar in together. That’s that, the best cream cheese icing you will ever taste. If you use a spoon to mix this icing you are going to get a good workout, the faster you mix and the longer you mix, the better it gets. 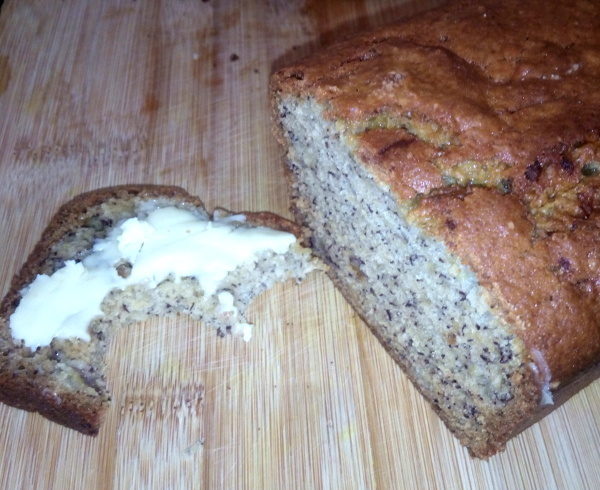 I have also smothered a banana bread in the original icing and I can tell you it is something you are going to want to try. 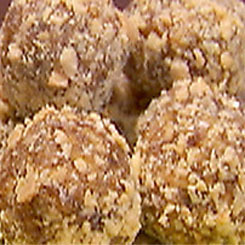 These homemade chocolate truffles are not the usual very rich almost too chocolatey truffles, they have a little crunch and use cocoa not chocolate. They are absolutely sublime and can easily be made without the rum for kids and those who don’t like alcohol. 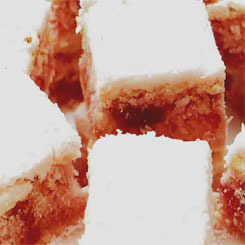 The best thing about this recipe is that it is so simple and can be made your own very easily, add a few nuts or cherries, less biscuit and more coconut, you get the idea. Have fun making them! Take your Packet of Marie biscuits and crush them up into small pieces. I use a bottle or rolling pin to break them up. Pop the butter into a mixing bowl and cream it with a spoon until the colour changes to a pale smooth consistency. It doesn’t take long but is really important. Sift in the cocoa and icing sugar, add the jam and the rum and give it a mix. Now add the crushed Marie bisuits and mix to combine all of the ingredients well. 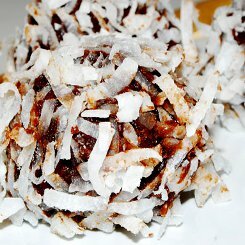 Place your coconut (you can alo use crushed nuts of some sort but coconut and rum work very well together) and place it onto a plate, them roll balls by taking a tablespoon size piece and rolling it in your palms. Drop into the coconut and then place on a baking sheet. Repeat until there is only one piece left for the cook! Pop the tray into the fridge for about 1/2 an hour. Store them in the fridge in a tupperware. These are a Chinese food delicacy of marinated Walnuts, nice and sweet with a hint of salt from the soy which gives it a little colour as well. They are quite a unique flavour and very morish, so if you are dieting …. just don’t go there! 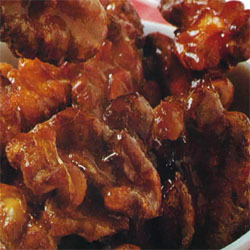 Combine the honey, lemon juice, and soy sauce together in a bowl and then add the walnuts. Mix them well and allow to marinate for about 2 hours. Drain the walnuts and discard the remaining sauce. Cover a plate liberally with caster sugar and coat the walnuts generously by tossing them around. Put about 3cm of cooking oil in a pot and heat to medium, them with tongs add the coated walnuts and deep fry until just golden. Here is a no fuss popcorn version of diddle daddle. These are something a little different for Easter and are so incredibly delicious you will be hard pressed to find anything quite like them. Anything made is so much better than bought and these will be appreciated by anyone receiving them. They are really simple to make and the family will love them. First off, place the crunchies and the white chocolate in the fridge to get brittle, then give them a few taps with a rolling pin or mallet to crack them into smallish pieces and set aside. Melt the butter in a pot over a medium to low heat, and add the plain chocolate broken up and allow to melt, stirring constantly. Remove from the heat ad allow to cool. 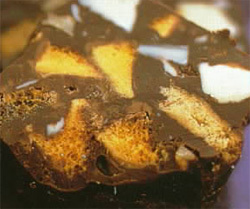 Add the pieces of broken up chocolate bars and and biscuits, stir gently to combine evenly. Place a large sheet of baking paper on your kitchen counter and spoon out the mixture into a log shape about 30cm long along the middle of the sheet. Roll the paper over the chocolate log and twist the ends until the log is quite tight and a nice round shape. Place in the fridge for about 2 hours until set, then remove the paper and cut into slices about 1cm thick. During the holidays, my kids often make things to sell to the neighbourhood and this one is a winner every time. For a little something extra and double the price, cover ithe fudge with a thin layer of chocolate like in the chocolate caramel slice. Simmer sugar, butter and milk together over medium heat, in a medium sized pot, until the sugar dissolves. Stir in the condensed milk and boil for 40 mins, stirring constantly. Remove from stove and beat in the vanilla essence with an electric beater on slow while it is very hot. Continue beating on a higher speed until the mixture is thick and foamy. Pour the fudge mixture into a shallow backing tray, lined with grease proof paper. Allow to set and cut into squares. I am a big fan of caramel and this chocolate caramel slice really hits the spot. It’s really very simple to make and just so good to have in your cupboard when the sweet craving comes around. Sift the flour into a bowl, add the coconut and castor sugar and mix to combine. Add the melted butter and mix thoroughly. Take a baking tray (approx 20x30cm), lightly butter it and line with grease proof paper. press the mixture evenly onto the tray to form an even firm base. Bake in a 180 Celsius oven for 10-15 minutes (when you see the base begin to brown it’s ready). Remove from the oven to cool. Add the condensed milk, 20g butter and golden syrup to a pot over a low heat and gradually bring to the boil. (stir constantly) Allow the mixture to boil gently for about 5 minutes or until a rich dark caramel colour. Pour the mixture over the base, spread evenly and then back in the oven for another 10 minutes. Remove and allow to cool. In a pot on a medium heat, add the cream and when you see bubbles appearing around the edges, remove from the heat, add the chopped chocolate and stir until completely melted and smooth. Pour over the caramel, spread evenly and place in the fridge to cool. Cut into little squares once cooled. These are real treats and perfect for school lunch boxes, make peanut brittle and have it around the house in broken bits for any time snacks. I love peanut brittle but you can use walnuts or almonds for a different brittle. I have also been known to toss in some sesame seeds for a change. Make this one your own. In a pot over a low heat add the water, sugar and syrup and stir until all of the sugar is dissolved. Bring to the boil and cook, not stirring for a further 3 minutes. Remove from the stove and mix in the peanuts, butter and bicarb of soda to coat all of the peanuts well. Pour into the lined baking tray and allow to cool. Snap into pieces.